But one day, she found a ship that would change everything an ancient Dignity Vessel and aboard the ship, the mysterious and dangerous Stealth Tech. Now, years after discovering that first ship, Boss has put together a large company that finds Dignity Vessels and finds "loose" Stealth Technology. 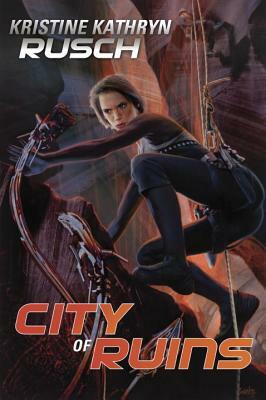 Following a hunch, Boss and her team come to investigate the city of Vaycehn, where fourteen archeologists have died exploring the endless caves below the city. Mysterious "death holes" explode into the city itself for no apparent reason, and Boss believes Stealth Tech is involved. As Boss searches for the answer to the mystery of the death holes, she will uncover the answer to her Dignity Vessel quest as well and one more thing, something so important that it will change her life and the universe forever. Kristine Kathryn Rusch is the author of Diving into the Wreck and Boneyards. She is an award-winning mystery, romance, science fiction, and fantasy writer. Her previous novel in this series, Diving into the Wreck, was nominated for Best Science Fiction and Fantasy Novel of 2009 in RT Book Reviews. She has written many novels under various names, including Kristine Grayson for romance, and Kris Nelscott for mystery. Her novels have made the bestseller lists even in London and have been published in fourteen countries and thirteen different languages. Her awards range from the Ellery Queen Readers Choice Award to the John W. Campbell Award. She is the only person in the history of the science fiction field to have won a Hugo award for editing and a Hugo award for fiction. Her short work has been reprinted in sixteen Year's Best collections. She is the former editor of the prestigious The Magazine of Fantasy and Science Fiction. Before that, she and Dean Wesley Smith, started and ran Pulphouse Publishing, a science fiction and mystery press in Eugene. She lives and works on the Oregon Coast. Visit her online at kriswrites.com"